The evil wizard, Malabruno, has locked away Don Quixote inside Story Castle! And he took all the books and scattered them around the forest! 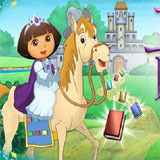 Lady Knight Dora needs your kids' help to rescue Don Quixote and find the missing books. Using leafy umbrellas, bouncy mushrooms, cushions, springy branches and water fountains, we must pass through three levels and solve riddles with our books.